"These are your grandmother's crafts, ya gotta problem with that?!" Er mah gerd, this project was EPIC! Yes, I started yesterday and did not finish until this afternoon! I did sleep, eat and drive my daughter to school, which was an expletive filled epic adventure this morning. Forgotten school event pass, back up mountain, slowest old person EVER in front of us on the way back down the mountain, miss turn, u-turn, drive-up ATM closed, out of gas...what?! Ergh. Tiny baby spiders covering gas pump, leap back into car and go to next pump, walk of shame into gas station cafe in dog hair covered pajamas to second ATM, miss bus, dog leaps in lap while driving, extract dog from lap, drive daughter to school with teen age boy riding our rear and stuck directly behind slow moving school bus the entire ride...HEY KIDS! YUP! WE MISSED IT! 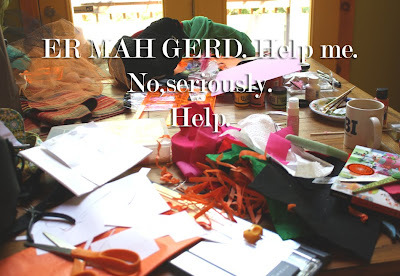 Return home to one minor craftastrophe after another...have I mentioned I'm impatient?! This lovely Hallowe'en project is inspired by the RETROFABULOUS new book by Craft Wars' judge and Glitterville mastermind Stephen Brown Glitterville's Handmade Halloween. This is the most luscious, scrumptious, stunning visual feast of a craft book created, photographed, designed and edited entirely by Stephen and his Head Studio Elf Chico. Stephen shares his secrets for making 20 exquisite projects inspired by his wildly successful Glitterville line. You may recognize Mr. Brown from TLC's Craft Wars, he's one of the judges! So Madge, being the brave and crafty fool that she is, decided to make her own project inspired by the book, rather than, say, making one actually in the book. I suggest, you follow Stephen's exacting directions and not veer off the garden path into chicken town. But hey, Stephen has a pet chicken named Dolly Poulet, Craft Wars host Tori Spelling has a pet chicken named Coco and I used to have 30 pet chickens...so what could be more apropos than a Hallowe'en Chicken? 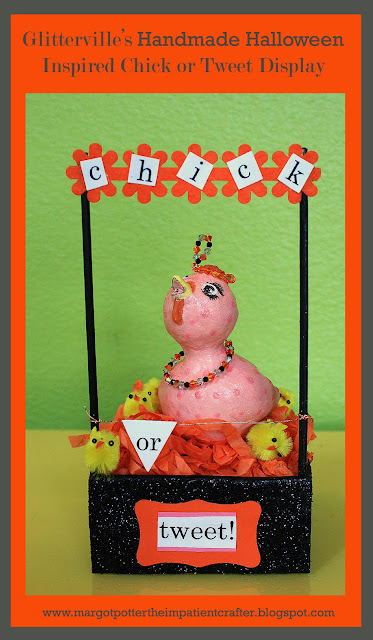 Meet Hen-rietta Henpeckt and her pecky chicks! 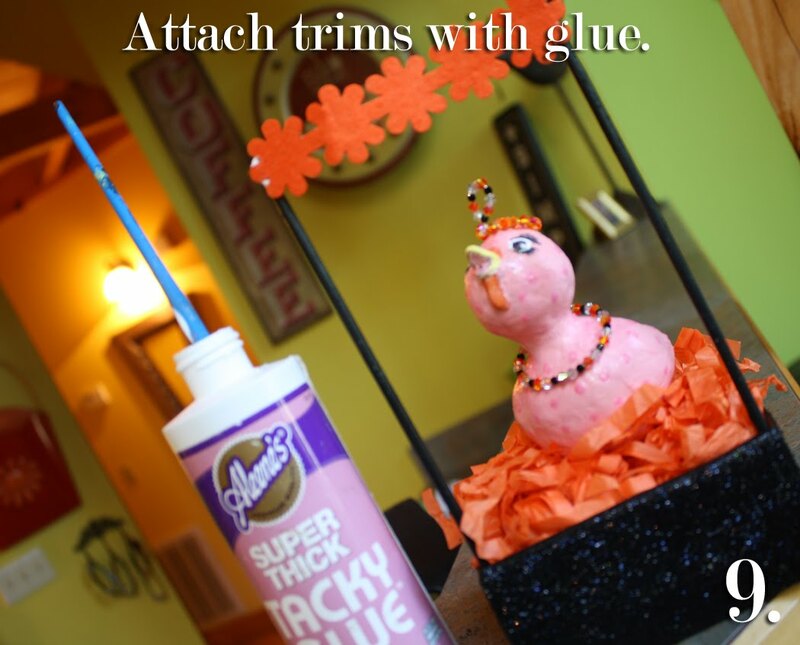 This project is made of inexpensive materials easily found at your local craft store and Aleene's Tacky Glue brings it all together perfectly. 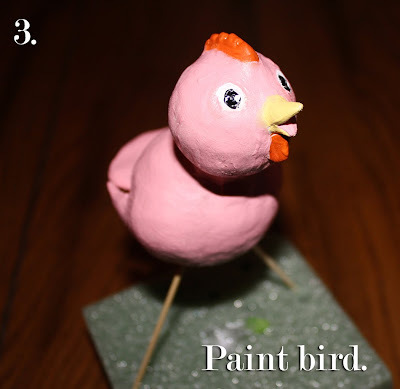 So here's how to make one! Printed Letters in Century Font 36pt. 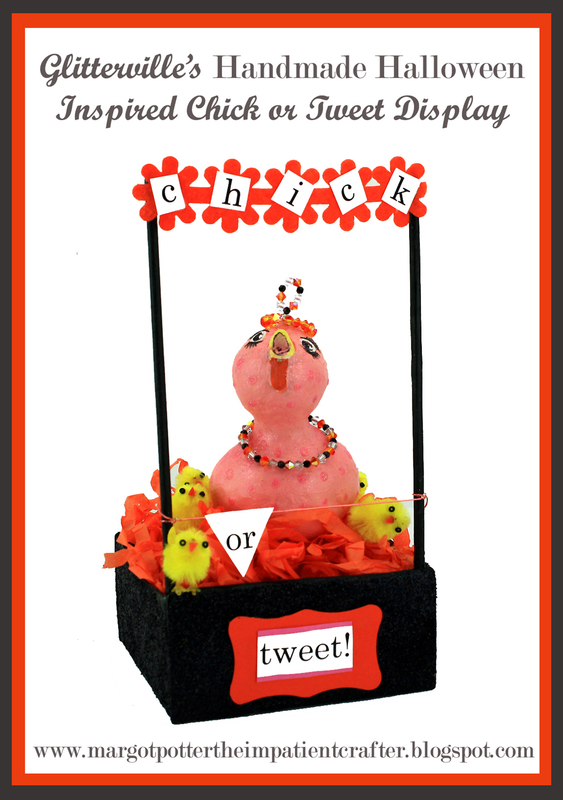 c h i c k or tweet! 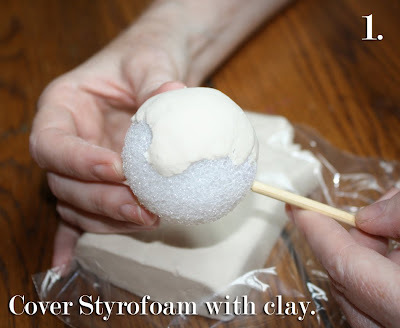 Cover foam balls with clay. Keep clay sealed and use small amounts at a time, use fingers to smooth, keep water nearby to help with this process. 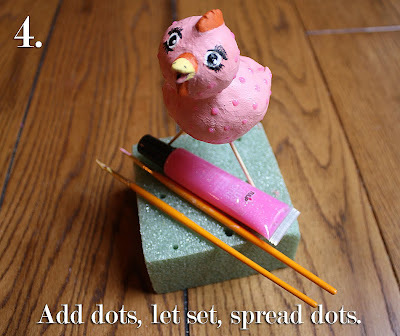 Use a toothpick to connect two balls, add clay around neck and smooth, use small cut toothpick segments as armitures, add clay to form beads. Use the end of a marker to create eyes. Create wings and attach to sides by wetting and smoothing clay. Repeat for comb, waddle and tail. Go back over bird with wet fingers until smoothed. 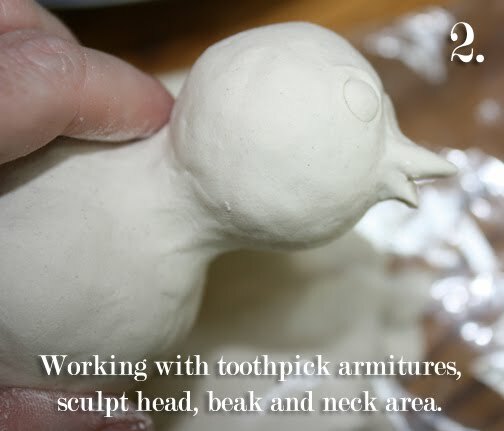 Insert a dowel into bird and allow to dry overnight. Use Tulip Beads in a Bottle in pink to add dots. Let dots dry for ten minutes. Use a flat wide brush to flatten dots and spread extra medium across bird. This adds a little sparkle and keeps bird from looking too bumpy! Cut a piece of floral foam to fit a 4x4" cardboard box, I used a saw to cut a little off of the top of my foam block. Leave some space for bedding and bird. Make a necklace using 20 gauge wire and 3-4mm crystals in black, orange and grey. Loop one end, bend the opposite end at a 90 degree angle, slide on bird, thread bent wire into loop, use round nose pliers to loop bent wire and secure closed. 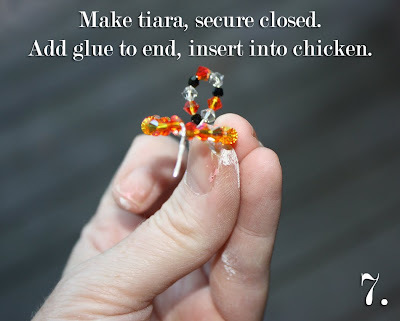 Make a tiara using 20 gauge wire. Thread 9 crystals on center of a 4" segment of wire, grasp and twist forming loop, add 11 4mm crystals to each end, loop on end, bend the other leaving a 1/4" tail. 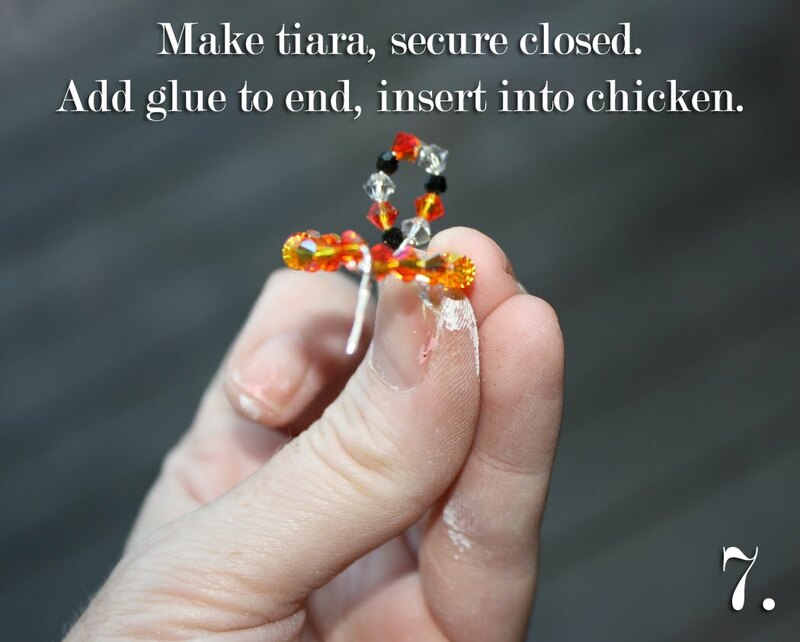 Add glue to tail, use chain nose pliers to insert tail into top of chicken's head behind comb. Adjust. Paint box black and allow to dry. Paint inside and outside! 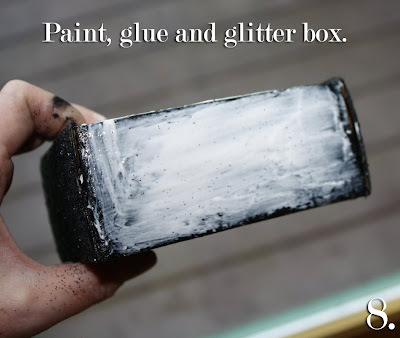 Use a flat wide brush to paint a layer of Tacky Glue on all exterior sides of back. 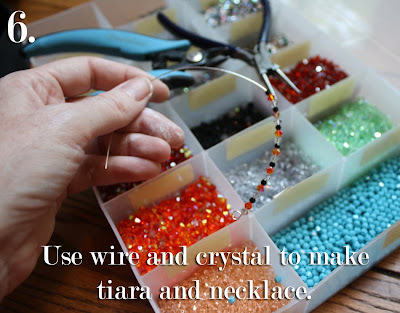 Pour glitter into bowl, use spoon to add to box edges, gently spread with fingertips and tap off excess glitter. Paint your dowels black, allow to dry. 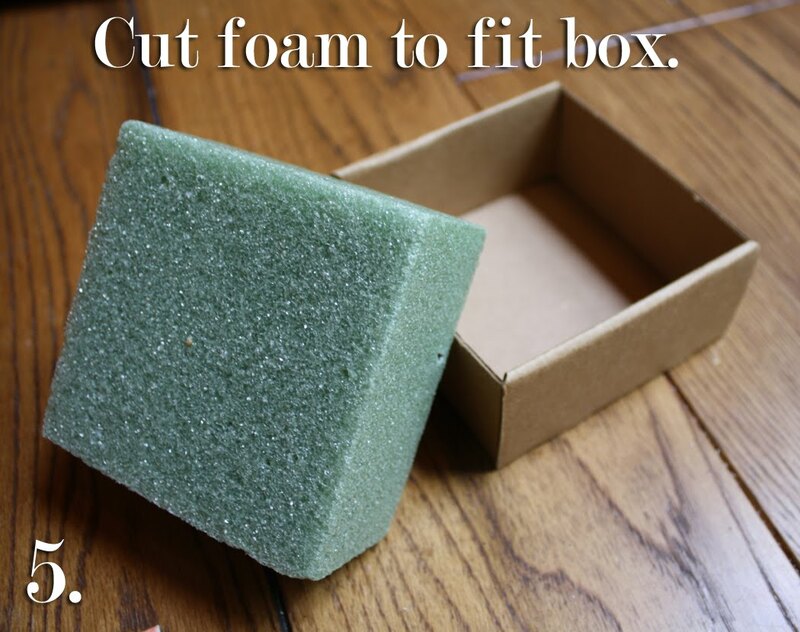 Insert into foam at front left and right side of box. Place bedding into box, cut off any stragglers. Insert a longer toothpick into bottom of bird, insert into foam using chain nose pliers. Attach felt trim to front tops of dowels using Tacky Glue. Cut all words and letters out. C h i c k is cut into separate letters, or is cut into a small flag and tweet! is cut into a rectangle. 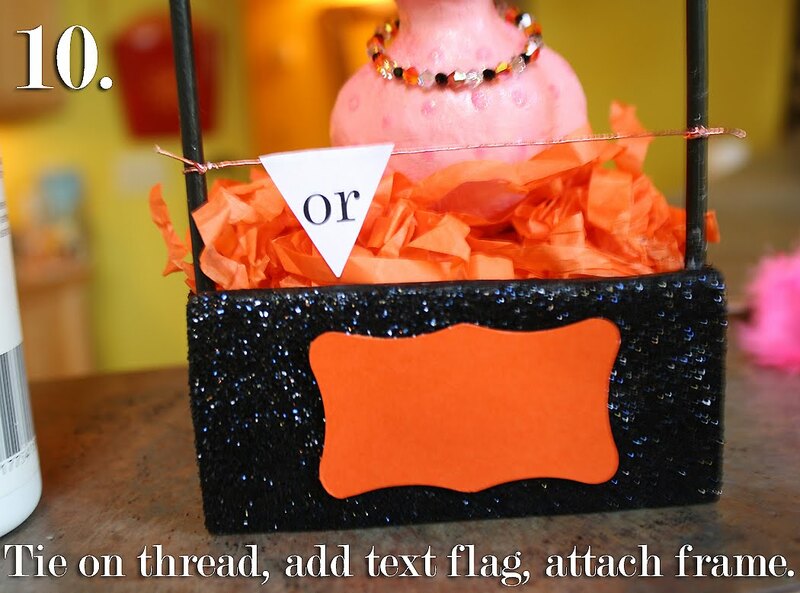 Tie metallic thread to dowels, leaving room for your flag. 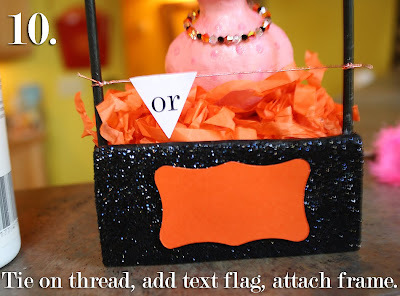 Attach flag with Tacky Glue to thread. Cut card stock frame (I used my Fiskars Shape Templates and Cutter), adhere to front of box, add pink card stock behind the word 'tweet!' and the letters to center of flowers on felt trim using Tacky Glue. Try your best not to make a mess this epic in the process. This is what happens when you take the side road to Chicken Town...HELP! So glad to hear it! It's so much fun to play with paper clay! Will come and visit, Diane!